She eventually returned to India to head up a women's dispensary. The case was picked up in mid-stream by the London Times and immediately became a political and media football. Everyone had an opinion. Not only were Rukhmabai's stream of letters about her case and the dark fate of Indian child brides generally published and intensely discussed, but so were the opinions of Hindu nationalists, marriage law reform advocates, and various members of the British ruling class. The controversy tied the bodies of Hindu girls to the stability of British rule in India. To Rukhmabai, the issue was inequality: Indian girls were being sacrificed to a system that robbed them of an education and personal freedom. Given that "there is not the smallest chance" that Indians would change their "abominable customs" on their own, she agitated for the British government to step in and raise the legal age of marriage. 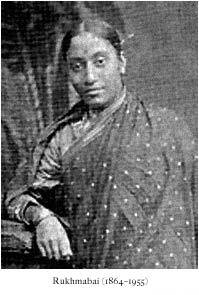 Rukhmabai's views were not shared by Indian nationalists, who regarded British tampering with local marriage practices as an assault on Indian pride. Britain had earlier pledged not to interfere with local religious practices, and in their opinion Rukhmabai's troubles were no cause to reverse that policy. British opinion on the Rukhmabai case was divided. Even as the British viceroy cabled messages to his colleagues that "it would never do to allow her to be put into prison," a British ex-judge in India opined in a letter to the Times that "in Eastern climates girls are precocious, and, unless early settled in her home, the girl is almost certain to disgrace her family." He went on to observe that the "real mistake was educating [Rukhmabai] so as to make her unfit company for her husband." On balance, the Rukhmabai affair probably hardened English resistance to Indian self-rule. If Indian men could not manage their domestic lives better than this, the thinking went, then they had no business taking on the more subtle challenges of statecraft. Then another story came along that changed minds. In 1890, the British media reported that an eleven-year-old Indian bride named Phulmonee had been literally "raped to death" by her thirty-five-year-old husband. This case had the requisite blood and guts to give reformers what they needed to convince the colonial government to take action. Under a new law, girls could still marry as young as ten, but consummation would have to wait for two years. The law was a victory for reformers, but whether or not it was ever seriously enforced is another question. Hindu nationalists continued to mount intense resistance, resentful of what they saw as top-down interference in the life of their country.